Sound is a peculiar thing – it is not an element, it has no atomic structure. Sound is a feeling. It only exists in our senses, and because sound is the primary sense that our brains develop in utero, it triggers a deeper subconscious response within us than our other senses. Which is why sound is one of the most important aspects in the post-production phase. Sound is 70% of what we see and it influences our perception of a film just as much as images do. Audio too loud? Limit it! We’ve often seen films at Kino where the sound is too loud or too soft. On the loud side, there is a simple way of stopping it. The solution in Premiere Pro is below, but please note that for Kino films, set the limit to -10db. Here’s the solution by the great Larry Jordan for Final Pro X users. Have you ever watched TV and suddenly the sound is so loud that you have to turn it down before your ears bleed? Wouldn’t it be nice if watch a show without having to touch the remote? With your own films, you can. Limiting audio is great for reducing loud sounds. But what about it increasing soft sounds? Whether you’re shooting an interview for a documentary or a suspenseful scene in a horror film, people speak at different volumes. Sometimes they whisper, sometimes they scream. For the audience of your film, it must sound convincing but it doesn’t need to be “real”. In real life, the range from loud sounds to soft sounds – the dynamic range – does not work in film. Loud sounds and the soft sounds must be brought closer to an average volume. This is called compression. When looking at the waveform audio below, the peaks (loud audio) and the troughs (soft audio) are compressed to reach a more consistent audio level. But what is a good consistent audio level? As a general rule, -12db is good. If your peaks are a +2db above that and your troughs are -2db below -12db, that will generally work. But it is subjective. This is not factoring the impact of music and sound effects will have on your dialogue. So use your ears, your judgement and your friends to provide feedback to what sounds best. More detail about the principles of compression. Very comprehensive. This is a good introduction into 4 areas of sound for film: Gain Staging and Volume, Compression, EQ and Reverb. 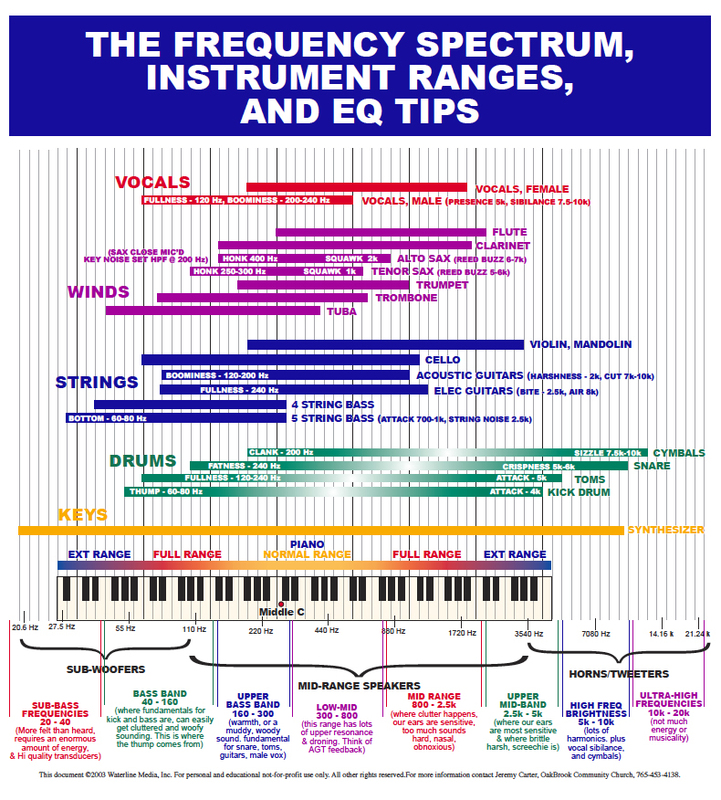 There is a particularly good chart for understanding audio frequencies from deep bass to fine treble.